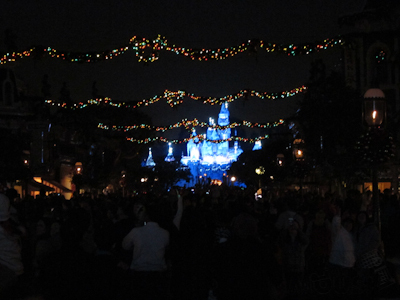 We hit the park tonight for the first time since the holiday decorations went up, and gosh, it reminded me of why I love holiday time at Disneyland so much. It’s just so beautiful. 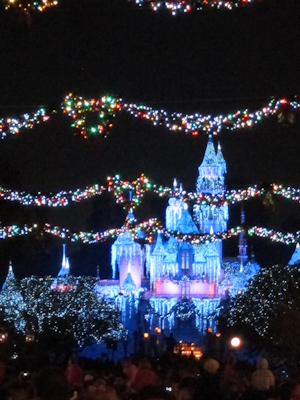 The castle looks amazing, the tree is awesome, and Main Street looks fabulous. Not to mention Small World. Well, I’ll mention Small World in another post. It was pretty crowded today, not surprisingly two days before Thanksgiving, so we didn’t expect to do much other than soak in the atmosphere. Well we tried to ride Small World (that again?) but the line was huge, so we skipped it. 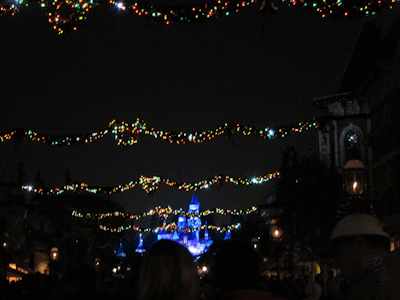 We did arrive just in time for the castle lighting, more formally known as the Wintertime Enchantment Holiday Lighting. This was a first for me, although I always knew such a thing existed. We were about 1/4 up Main Street from Town Square. Then things start to sparkle. 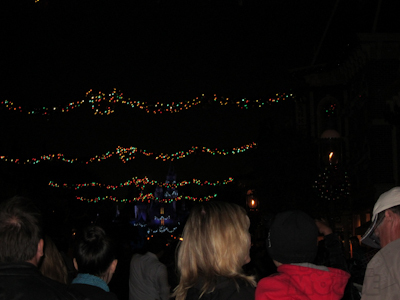 There are little white lights that go on and off on the castle, on the garlands above Main Street, and the big tree (which I didn’t get a picture of). 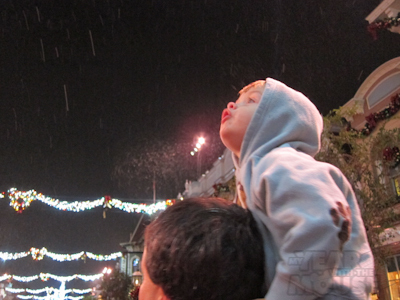 And then one of my favorite Disneyland holiday things–it snows! What's this in your hair? I will never get tired of the snow at Disneyland, particularly the look on kids’ faces when they see it for the first time. 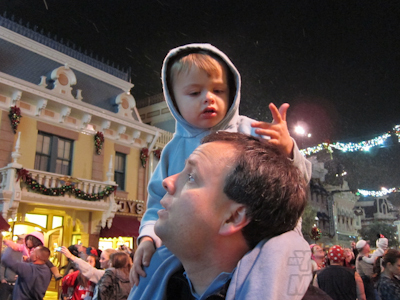 Theo is an old hat when it comes to Disneyland snow, but he still oooohed and aahhhhed over it. Following that, the castle is fully lit and just beautiful. The castle lighting happens about 4 times a night, so check your entertainment schedule and position yourself in front of the castle somewhere to check it out. It’s such a nice little touch of holiday magic.